For games for the Japan-only satellite add-on, see Satellaview. 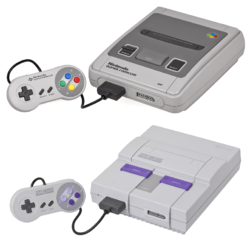 The Super Nintendo Entertainment System (known as the Super Famicom in Japan and Hyundai Super Comboy in Korea) is the 16-bit successor to the Nintendo Entertainment System. It was first released on November 21, 1990 in Japan, and after some aesthetic changes saw a North American release on September 1, 1991. Later, it was released in 1992 in Europe, South America and South Korea, and in 1993 in Oceania; in all these countries (more than 30) it kept the original Japanese logo and a console design essentially identical to the Japanese original. The games, though no longer produced, are still quite popular. Many titles have since reappeared on the Game Boy Advance and Wii Virtual Console. The Super Scope, or Nintendo Scope in Europe, is the official SNES light gun. It was released in the European and North American markets, with a limited release in Japan due to a lack of consumer demand. It is a wireless gun and uses an infrared receiver which plugs into the right port of the console, comparable to the Menacer for the Sega Mega Drive. It has two action buttons, a pause button, a power switch and is powered by six AA batteries. All of the Super Scope games made by Nintendo have a soft-reset to the game's main title. This is accomplished by pausing the game, then, while holding CURSOR, the FIRE button must be pressed twice. The gun body is a bazooka-shaped device, just under 0,8 m (2 ½ feet) long. In the middle on either side are two clips for attaching the sight. On the end is the infrared transmitter and the lens, which picks up the light from a TV. The sight is designed so that the aim will be correct at a distance of 3 metre (10 ft). On the front of the receiver is an oval-shaped black area, receding back from the two sides to a red sensor about the size of a dime. The Super Scope ignores red light, as do many guns of this type, because red phosphors have a much slower rate of decay than green or blue phosphors. Since the Super Scope depends on the short persistence of CRT pixels, it will not function with modern displays (such as plasma screens or LCDs) that continuously light each pixel. The Super Game Boy is a cartridge-like addon for the SNES that would allow Game Boy and Game Boy Color games to be played through the SNES. Black & white Game Boy games will be displayed as color games, although the color palette will be limited. Both Game Boy and Game Boy Color games will be displayed on the screen with a border frame specific for the game. This page was last edited on 20 May 2017, at 15:06. This page has been accessed 169,326 times.